I came up with a new method to induce the sensation of motion and acceleration in seat-based simulators! I call it the Motion Integrated G-Seat as it combines the strengths of a motion platform with those of a G-Seat and integrates them into one single system. It is able to deliver an unprecedented sensation of intense, swiftly reversible and sustainable feeling of motion and acceleration in all axes. The prototype on the left looks (a bit) like an aircraft ejection seat, but the Motion Integrated G-Seat can be used in all kinds of seat-based simulations! Almost any effects resulting from acceleration can be simulated! From high frequency disturbances when jolting over road bumps or through aerial turbulence, to longer lasting forces when cornering a race car or ‘pulling Gs’ in a fighter jet. When you hit the brakes you get tossed forward into the harness, when you "pull G's" you feel pressed down into the seat. Flying upside-down lifts you upwards, feeling like hanging in the shoulder harness. The effects induced by the Motion Integrated G-Seat are instantaneous, can reverse direction swiftly and most importantly, are sustainable - meaning they can last as briefly or as long as the simulated acceleration does. The Motion Integrated G-Seat not only works great in VR, it immensely enhances the immersion, as the induced movement of the body correlates exactly to the natural shifting of the eyepoint during accelerated maneuvers (e.g. forward while braking, left when turning right, up during negative Gs and so forth). Unlike other motion systems, the Motion Integrated G-Seat needs just a little more space than a static seat and can thus be incorporated into any fixed-base cockpit or car simulator. 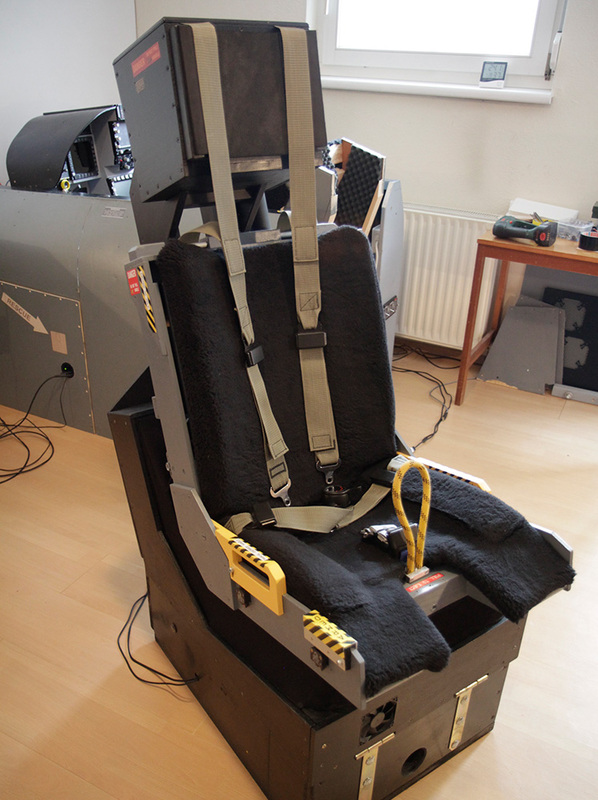 I have it installed in my F-18 flight simulator, which only provides a width of 53 cm (20,8 in) for the seat. The Motion Integrated G-Seat uses pressure applied to crucial parts of the body by moveable elements in the seat pan and backrest, combined with tightening and releasing of the shoulder harness and seat belts, integrating everything into an overall motion of the seat. It can tilt forward and aft, left and right as well as move up and down by about 8 cm (3 in). This combination of motion and change in pressure is effectively creating the impression of beeing accelerated. All effects of the Motion Integrated G-Seat are achieved by only three motors driving an internal mechanism of a sophisticated but robust array of force distributing rods and pulleys, resulting in low material costs, low weight and high reliability. The components used in the prototype cost me less than 1.500 €! As I neither possess the resources nor the time currently to produce the seat in any larger quantity, it is not for sale at the moment . If you happen to be in charge of a company interested in producing and launching the Motion Integrated G-Seat, you are very welcome to contact me. Your name: NOTE: Your name will be displayed in the header of your post. E-mail: NOTE: Your e-mail will not be displayed in your post! It is only accessible to the owner of this site for reference! NOTE: You can DELETE your post again anytime as long as your browser window is not closed! Do you really want to delete your post? Your seat looks to copy the existing design of the Simxperience G-Seat. No Jett, not a bit! The mechanics of my seat are fundamentally different. They drive seat motion, seat geometry and harness belts all at once. To my knowledge, the Simexperience seat is static with moving paddles and can as such be mounted on some kind of ancillary motion system. Absolutely awesome Motion Integrated G-Seat man. Thanks. 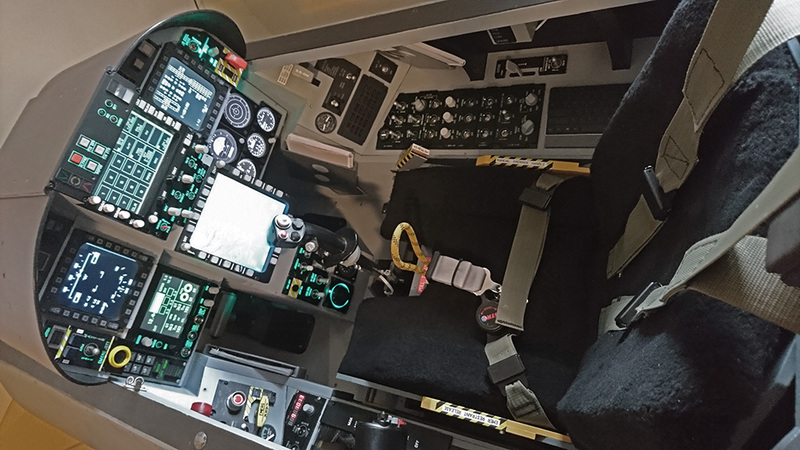 I have a couple of Andre's KW-908 jet-seats, one in a Block 52 F16 cockpit and another in an F1 Car simulator (both home built) which have been great and added to the total immersion of both sims I use.....but this is a totally different dimension and as I can see immersion level. I am excited and thanks for sharing your awesome project. I to would be extremely interested in a Motion Integrated DIY kit. Have you made any progress along those lines in the past couple of months? thanks for your comment! I am still investigating means of making a commercial version of the seat available not only for professional use but also affordable to the sim community. The DIY version with a kit and/or the plans and instructions is still also something I'd like to realize, but it will take some more time, hang on! Unbelievable, this is amazing. I just got into VR and this would add so to the immersion factor. I do think you need to have a real cockpit with switches as you will not be able to move a mouse cursor to manipulate switches. I hope you find a way to market this. I could imagine selling a part list and plans too but how do you prevent people from sharing it? Thanks Peter! Having a "real" cockpit is nice of course, but you don't necessarily need one with the seat. It is also great with just some controllers and a screen or with a VR headset. Actually, it is also hard if not impossible to manipulate switches in a real aircraft during agressive maneuvers or severe turbulence. The same applies for using a mouse cursor, it only adds to the realism! Incredible work. How much maintenance is required on the seat? Are the parts easily replaceable/repairable if something breaks? Thanks Alex! Apart from charging the batteries, there is no maintenance required.The internal mechanism is very robust, I doubt something is going to break there anytime soon. The weakest parts would be the motors, but the seat is designed not to demand their maximum capacity. They merely get warm even during long operation. If a part there should fail, it would easily be accessible for repair or replacement. I´m building a VR cookpit, and have tryed some motion platforms, but non of them was any good, as you discovered too. Can I in any way, buy your drawings ect, so I can buildt a G-seat my self, and avoid all the trails n`errors you have discovred ? Hello and thanks for your question! I do not disclose or sell plans for the seat at this moment, as I am evaluating means of bringing it to market. This might include the possibility for DIY builders to purchase instructions or assembly kits too. Please hang on! Wow! This is a really amazing concept!! 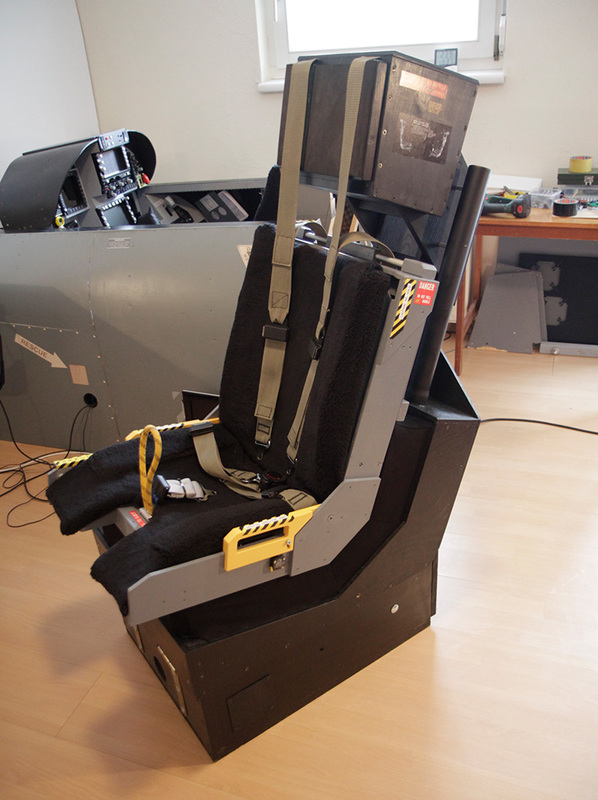 Are you, or will you do a video of flying your F-18 with your Motion Integrated G-Seat? And Have you thought about doing a video such as MRPilot does in mixed reality. With your MIG-Seat (cool acronym, huh? :-) ) and F-18 cockpit, that would make a really awesome video! BTW, the links in your earlier reply below are broken. Thanks George! Like I said at the end of video #2, I am working on the next video right now, showing the seat inside my F-18 simulator. I don't think I can produce something as cool as MRPilot though, but I'll do my best to show the seat performing in an aircraft as descriptively as possible! This is awesome!! Have you thought about selling the plans and software? Thanks Michael! Well, I am ready to start sales or contract talks with anyone, if he/she/the company in line intends to produce the seat in a reasonable quality and quantity to offer it in the public market.